On September 25–28, WindEnergy Hamburg 2018 – the world’s most important wind energy event – took place. The 2018 edition was the biggest yet and had plenty to offer attendees. Whether visitors wanted to learn about innovative new products or attend panel discussions about the future of the sector, there was something for everyone. Here’s a recap of the event. In order to tackle challenges in wind power, such as optimizing the levelized cost of energy (LCOE), all players in the sector must work together. WindEnergy Hamburg 2018 provided the ideal platform for this by bringing organizations from all over the world together. Exhibitor booths displayed the latest technology developments for extending wind turbine service life and boosting productivity. Companies showcased a wide range of solutions for wind farms. Examples include filtration and anti-vibration systems that protect machinery against typical conditions found in wind turbines. Remote inspections were also a key focus, with some companies explaining the benefits of using drones for this task. Trade visitors had the chance to talk with representatives from solution and service companies about challenges they may be facing, find ways to boost wind farm performance, and become more cost effective. WindEnergy Hamburg 2018 hosted approximately 35,000 trade visitors from 100 different countries and 1,482 exhibitors from 40 nations. As well as the exhibition, the event also included Wind Europe 2018, a comprehensive conference program, featuring expert speakers from various backgrounds. There was a diverse range of topics up for discussion, such as how standardization can boost safety, different uses of data for improving reliability, and what job skills will be required in the future. The panel discussions and question and answer sessions allowed attendees to hear from decision makers in the industry and learn about the current and predicted trends in wind energy. Visitors also had the chance to ask experts questions on topics like pursuing a career in the wind power sector. 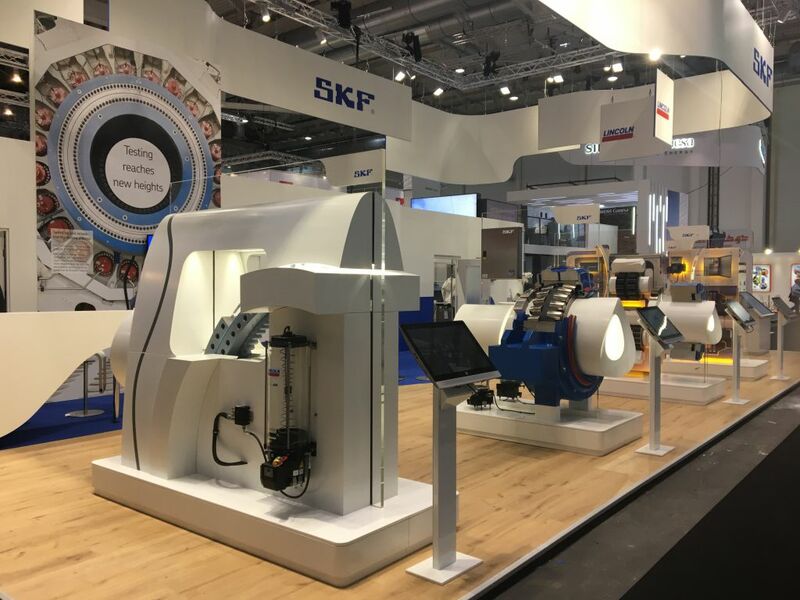 The SKF stand at WindEnergy Hamburg 2018. SKF certainly didn’t miss the chance to get involved. Experts at its stand in Hall B6 welcomed many visitors who wished to talk about topics including bearings, lubrication, seals, and condition monitoring. The company showcased some of its leading products for the wind industry, such as spherical roller bearings for wind turbine main shafts. There was also a demonstration video of the Wind Farm Management Blog, SKF’s content hub for wind energy news, insights, and the latest innovations. The 2018 event was a fantastic opportunity for everyone involved with the wind energy sector to network and find out more about what’s happening in the industry. The next edition in 2020 is sure to expand and build on the success of 2018. If you can’t wait for WindEnergy Hamburg 2020 or if you missed this year’s event, be sure to check out the Wind Europe Conference and Exhibition 2019 in Bilbao, Spain.